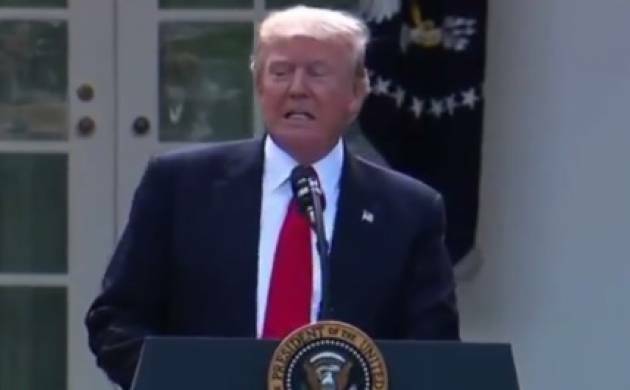 President Donald Trump on Thursday announced his decision to withdraw the US from the Paris Agreement on climate change and renegotiate the deal that was agreed upon by over 190 countries during the previous Obama administration. Arguing that countries like China and India are benefiting the most from the Paris Agreement, Trump said that the agreement on climate change was unfair to the United States, as it badly hit its businesses and jobs. He said that New Delhi would get billions of dollars for meeting its commitment under the Paris Agreement and it along with Beijing would double its coal-fired power plants in the years to come, gaining a financial advantage over the United States. Announcing his much-anticipated decision from the Rose Garden of the White House when the day temperature was around 26 degrees Celsius, Trump said he has been elected to represent Pittsburgh and not Paris. He said he is taking the decision to protect the interest of American businesses and workers. “I am fighting every day for the great people of this country. Therefore, in order to fulfil my solemn duty to protect America and its citizens, the United States will withdraw from the Paris climate accord but begin negotiations to re-enter either the Paris accord or really entirely new transaction, on terms that are fair to the United States, its businesses, its workers, its people, its taxpayers,” he said. “We are getting out, but we will start to negotiate, and we will see if we can make a deal that’s fair. And if we can, that’s great. And if we can’t, that’s fine. As president, I can put no other consideration before the wellbeing of American citizens,” he said. “The Paris climate accord is simply the latest example of Washington entering into an agreement that disadvantages the United States, to the exclusive benefit of other countries, leaving American workers, who I love, and taxpayers to absorb the cost in terms of lost jobs, lower wages, shuttered factories and vastly diminished economic production,” said the US President. Trump said as of today, the United States will cease all implementation of the nonbinding Paris accord and the draconian financial and economic burdens the agreement imposes on the US. This includes ending the implementation of the nationally determined contribution and, very importantly, the Green Climate Fund, which is costing the United States a vast fortune, he said. Compliance with the terms of the Paris accord and the onerous energy restrictions it has placed on the United States could cost America as much as 2.7 million lost jobs by 2025, according to the National Economic Research Associates, he said. On the other hand countries like India and China are benefiting the most from the Paris Agreement on Climate Change, he added. “Not only does this deal subject our citizens to harsh economic restrictions, it fails to live up to our environmental ideals. As someone who cares deeply about the environment, which I do, I cannot in good conscience support a deal that punishes the United States, which is what it does,” he said. The world’s leader in environmental protection, while imposing no meaningful obligations on the world’s leading polluters, he alleged. For example, under the agreement, China will be able to increase these emissions by a staggering number of years-- 13. “They can do whatever they want for 13 years. Not us,” he said. “India makes its participation contingent on receiving billions and billions and billions of dollars in foreign aid from developed countries. There are many other examples. But the bottom line is that the Paris Accord is very unfair at the highest level to the United States,” he said. China, he said, will be allowed to build hundreds of additional coal plants. “So, we can’t build the plants, but they can, according to this agreement. India will be allowed to double its coal production by 2020. Think of it. India can double their coal production. We’re supposed to get rid of ours. Even Europe is allowed to continue construction of coal plants,” he said. According to the US President, in short, the agreement doesn’t eliminate coal jobs. It just transfers those jobs out of America and the United States, and ships them to foreign countries. “This agreement is less about the climate and more about other countries gaining a financial advantage over the United States,” he said. “The rest of the world applauded when we signed the Paris Agreement. They went wild. They were so happy. For the simple reason that it put our country, the United States of America, which we all love, at a very, very big economic disadvantage,” he said. Read | Climate change may result in disappearance of Arctic ice by 2040, warn scientists; will $500 bn proposal save glaciers?